Until recently the wild horses in Australia’s national parks were culled. Nowadays a number of Brumby rescue organisations are capturing the horses in a humane way and then taking them to Brumby rescue reserves. 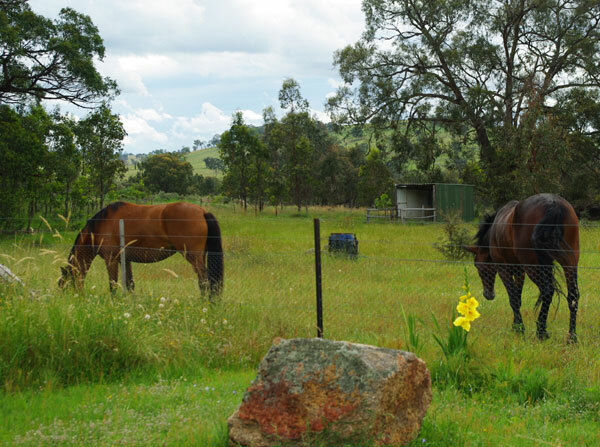 These two beautiful fillies were born in the wild country of the Guy Fawkes National Park just east of Armidale. Captured when they were young, they were raised for a year or so by the Save the Brumbies charity before being adopted by a horseman on the northern NSW coast. Unfortunately Abby didn’t fare well close to the coast – midges and other bitey things irritated her skin. So their adopted human parents asked us to accommodate them while Abby’s skin improved. As we are in the accommodation business and I’ve been a horse-mad girl all my life we said “Of course!”. We took both of them because horses, and particularly Brumbies, are a herd animal with strong family ties. Abby and Music had never been separated in their lives. 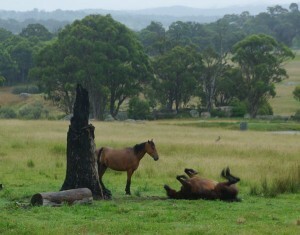 It was obvious after only one day on the property that the fillies were happy to be back home on the New England tablelands. Abby’s skin started improving within days. No more hours spend scratching herself on trees, fence-posts and human shoulders. The midge-free climate meant she could relax and heal. But whatever their skin, horses love a good scratch and one way to get one is to roll about in some nice sand. Music and Abby love company and are frequently peering over the gate near the Shearing Shed to see if a pat or a carrot is coming their way. At other parts of the day especially near dusk they play one of their favourite games – chase the kangaroo.